Interestingly enough, the video also reveals another surprise. Underneath the massive headspreader is actually a four die configuration, similar to the die configuration of AMD’s Epyc server CPUs. 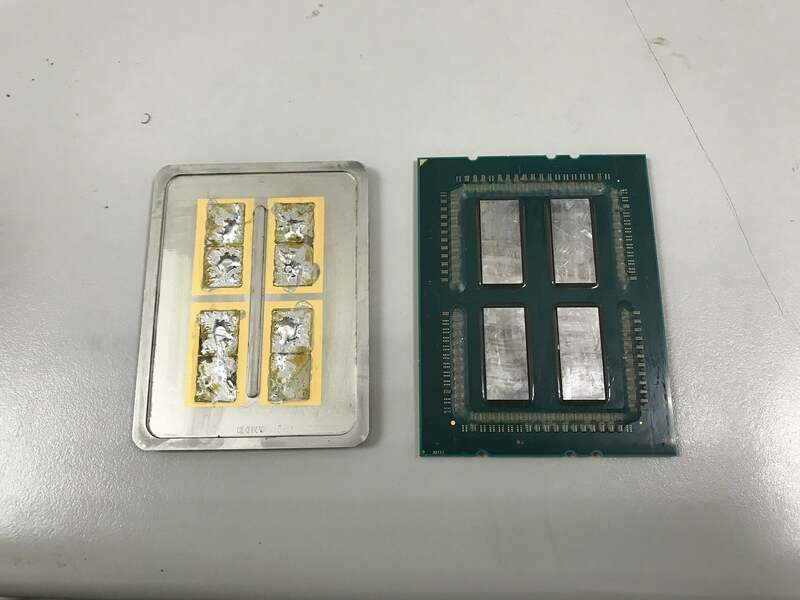 However, according to der8auer, two of the dies are disabled which is why Threadripper maxes out at 16-cores rather than the 32-core of Epyc. This is a bit strange as the whole point of using a MCM (Multi-Chip Module) with Infinity Fabric is to improve yields and lower cost, and putting an extra two disabled dies onboard doesn’t exactly achieve this purpose. Either way, be sure to check out the video below for the full de-lidding! It appears that at AMD’s request, der8auer had to remove his Threadripper de-lidding video however, he expects to be able to re-post it after a certain time has passed.